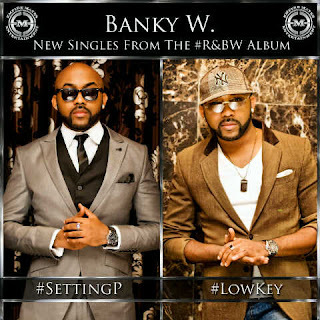 BANKY W is BACK with TWO brand NEW singles - the infectious R&B slow jam #LowKey and the massive party jam #SettingP - to serve as the lead singles from the forthcoming #R&BW album! The Sarz-produced #LowKey is a compelling R&B slow jam which not only gets you in that baby-making mood but also excellently showcases Banky W's vocal dexterity and his songwriting prowess over captivating keyboard and violin arrangements and well-placed drum patterns. Co-produced by MasterKraft and Banky W himself, #SettingP is a massive dance floor filler which is led by lush percussions and talking drums and grandiose synths which fuse beautifully with Banky W's undeniable vocals that will most definitely get you dancing and going down low for all of four minutes. Soon after came his debut release, the award-winning Undeniable: The E.P and the critically acclaimed Back in the Buildin' before a move to Nigeria which saw the releases of the innovative album Mr. Capable in 2008 and the groundbreaking The W Experience album in 2009 which birthed the Number 1 singles "Strong Ting" and "Lagos Party" and garnered Banky W many awards and award nominations from the Soundcity Music Awards to the MOBO Awards to the MTV Awards to the KORA Awards and more. Outside his exploits in music and amongst many other accomplishments such as being a published writer, a philanthropist and a seasoned Master of Ceremonies/Host, Banky W is also a proven Leader and CEO, having catapulted one of his protégés Ayodeji 'WizKid‛ Balogun into full fledged Superstar Status, by executive-producing his critically acclaimed debut album and serving as the Musical Director for his Massive Launch in June of 2011 at the Expo Center in Lagos Nigeria. The 2011 Samsung and Hennessy brand ambassador will no doubt take African R&B music to a whole new level with the release of his new singles, #LowKey and #SettingP - the prelude to the very anticipated #R&BW album.